– Diana Budds, “The Best New Schools Don’t Look Like Schools at All,” Fast Co. Design. 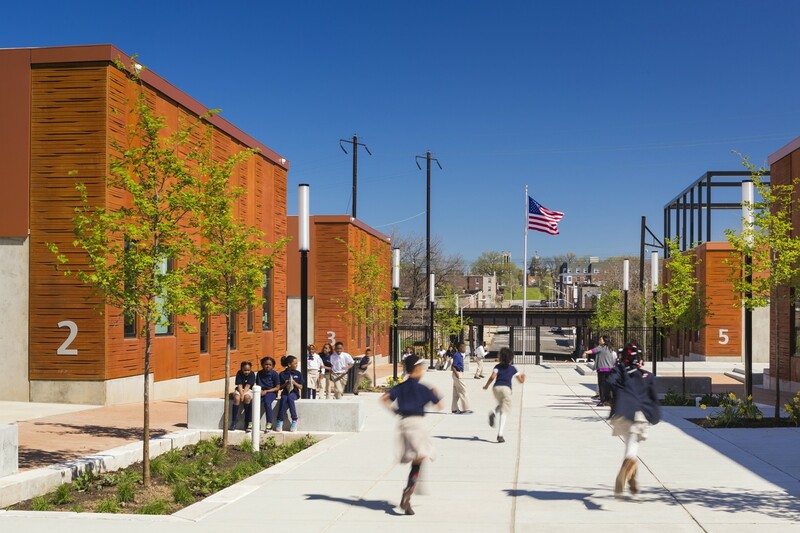 Designed by Rogers Partners Architects + Urban Designers, Baltimore’s Henderson Hopkins School is an award-winning example of the power of architecture to amplify human potential. Rogers Partners is a full-service design firm based in New York City with an office in Houston, Texas, that provides master planning, urban design, architecture and landscape architecture design services. Rogers Partners’ practice includes architects, urban designers and landscape architects with a breadth of experience ranging from schools to parks and open spaces, streets and plazas to multi-building campuses. We asked Rob Rogers, Partner, and Vince Lee, Associate Partner, to give us insight into the Henderson Hopkins design philosophy and experience. IAM Lab: Were you drawing on any previous projects in particular when approaching the design for Henderson Hopkins? VL and RR: Our research included many international examples of progressive school design which shaped the design concept of the school, including the scaling, organization, redefinition of learning spaces and the connections to exterior. The curricula introduced to us by the ownership team were specifically influential. The project particularly benefited from the shared aspirations of the East Baltimore Development Initiative, Johns Hopkins University (JHU) and the JHU School of Education under the leadership of former Dean Andrews. All parties were deeply committed to the notion of Henderson Hopkins becoming a new neighborhood anchor for east Baltimore. IAM Lab: What did you have to learn about Baltimore to do this project? VL and RR: We researched the architectural, social and cultural history of East Baltimore extensively. We looked back to understand the neighborhood, where its unique fabric came from, how it worked. Our look back taught us the interesting and proud history of the neighborhood, specifically the alley house network that was developed by bohemian immigrants who sold their land and moved to Baltimore to escape war with Germany. Houses were sized so these immigrants could afford to buy them the day they arrived, with the help of bohemian associations centered with the church. These 100 percent owner-occupied dwellings created a unique community within the city. The scale, composition, pattern and rhythm of East Baltimore inspired the planning and the architecture of the school. Major communal arteries and social centers continue through the two-block campus. Baltimore’s building block of row houses and internal courtyards inform the plan of interior and exterior learning spaces. Facades step down along the street; the ubiquitous neighborhood form-stone is reimagined in the grooved pre-cast concrete; the glowing Commons set education as a visual landmark following the city’s church steeples’ tradition. This project represents what architecture for education can really be about: enabling students, teachers and community. In its intentionally porous, safe, urban plan and through the craftsmanship of light, materiality and performance, the Henderson Hopkins School respects history and supports the future of education and of this neighborhood, while instilling an understanding of place within the shifting landscape of East Baltimore. IAM Lab: How does your design enhance teaching and learning? VL and RR: The color families chosen for Henderson Hopkins were carefully developed to support the idea that color has the ability to positively impact student learning. The colors chosen progress with the age of the students. Very young children are stimulated by warm bright colors like yellows and oranges; in elementary school the palette evolves to bright medium cool colors such as greens and blues, and then matures in middle school to darker colors more conducive to socializing like deep turquoise and violet. The design promotes the literal and figurative educational process. Visual and physical connections from one House to the next are one of the design’s key principles. Each House has a Commons for lunching and flexible teaching/learning and a defined outdoor Learning Terrace, creating parity between indoor and outdoor commons. The Commons is immediately adjacent to outdoor spaces for play, learning and exercise. This proximity and constant availability encourages health and increases student attention and focus. This decentralizing strategy promotes individual learning and growth, rare for public education. These connections inspire children to see and aspire to their future. IAM Lab: How do you balance goals around building community and fostering relationships with the desire for quiet spaces and open spaces? VL and RR: To facilitate the creation of community within the school, classrooms are organized into Houses by age range — not grade. The House clusters create small learning communities of up to 120 children, a group size that is scientifically determined to allow each child to be known by his/her entire community. Each House centers on a main Commons Learning Space, which connects to the smaller Flexible Learning Space and an Exterior Learning Terrace. The school’s learning spaces vary in size and enclosure from traditional classrooms to flex spaces to permit multi-modal instruction and individualized learning. The classrooms will be able to evolve as curriculum, student needs and activities change. Even lunch is reconsidered, kept close to classrooms and age specific, permitted by small adjacent food serveries. From enclosed and protected for the youngest, to partially open for older children and integrated into the school’s public main arteries for the oldest students, the courtyard Learning Terraces are designed to encourage the development of motors skills and collective engagements appropriate for the age groups. IAM Lab: Have you heard of any “unintended” benefits of your design? VL and RR: We heard from teachers that adjacent generous spaces encouraged running, so teachers needed to manage groups and set expectations for speed of personal travel. IAM Lab: Have you conducted any evaluations of the design? VL and RR: No formal evaluations have been completed. Given that this is a new school typology built around new teaching learning modalities and pedagogies it would be challenging to weigh the impact of design vs the educational considerations. IAM Lab: What lessons from this project have you taken into other designs, if any? Among the many takeaways from this project is a reaffirmation of the belief and understanding that the importance of schools extends beyond education and their impact and presence impacts and informs civic community and pride. JHU understands this bigger picture, that a school needs to be more than a school; schools are uniquely positioned to provide important wraparound services for the surrounding community.